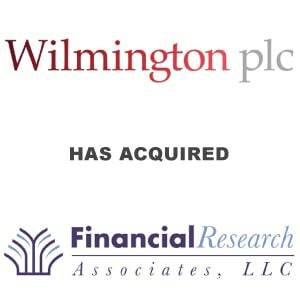 Wilmington plc Acquisition of Financial Research Associates LLC - Berkery, Noyes & Co., LLC. Wilmington plc (“Wilmington” or “the Group”), the knowledge leader in Risk & Compliance, Finance, Legal, and Insight, announces the acquisition of the trading assets and assumption of certain liabilities of Financial Research Associates LLC (“FRA” or “the business”), a leading US conference and networking provider of specialist events in healthcare and finance, for a maximum consideration of up to $20.6m (£13.2m). Wilmington is acquiring FRA from its founding management team, who will continue in the business. The acquisition comprises a net initial consideration of $13.0m (£8.3m) in cash with two deferred consideration amounts of $1.5m each payable on 1 July 2016 and 1 July 2017 conditional upon the continued employment of the management team. Further deferred consideration of up to $4.6m is potentially payable in cash subject to FRA achieving challenging revenue and profit targets in the two financial years ended 30 June 2016 and June 2017 respectively. The net and any deferred consideration will be financed out of the Group’s existing £65m multicurrency debt facility. The acquisition is expected to be earnings enhancing in the first full year of ownership. As previously announced on 2 July 2015, Wilmington has extended its £65m revolving credit until 1 July 2020 with an option to increase the facility to a total commitment of £100m. FRA, was established in 2001 and is managed by Lori Medlen, CEO and Ellen Wofford, COO. It has a successful portfolio of over 80 specialist events, focussed on finance and healthcare. FRA has 47 employees based in two offices; Charlotte North Carolina and Santa Cruz California. It enjoys a high proportion of repeatable revenue with over 75 percent of 2014 revenue coming from recurring annual events. Approximately 60 percent of revenue comes from healthcare events (healthcare forms the majority of Wilmington’s Insight division) and 40 percent from Finance. In line with Wilmington’s ambition to enhance its international presence, FRA’s turnover is generated in the US and its acquisition will increase the proportion of the Group’s revenue generated from international markets. In the twelve month period ending 31 December 2014, revenue for FRA was $10.5m and underlying revenue increased by 19 percent driven by the success of its two flagship healthcare events; Resource Initiative and Society for Education (“RISE) held annually in Nashville and California. The RISE events are the premier events for healthcare professionals and executives from all industry segments as well as healthcare providers and have a membership association of over 1,000 members. During the twelve- month period ending 31 December 2014, FRA made an adjusted profit before interest, amortisation and taxation of $2.6m*1 and had gross assets of $1.4m*1. At 30th June 2015 the value of the assets net of certain liabilities acquired resulted in a net liability of $0.4m*1. The acquisition of FRA is consistent with Wilmington’s strategy of acquiring complimentary businesses with high repeat revenues and strong, cash generative income streams in the Group’s key markets. FRA’s business provides Wilmington with additional networking expertise and will support the Wilmington Insight and Finance divisions. FRA will work closely with other Wilmington companies in the US, including Compliance Week (the provider of governance, risk and compliance information), and with UK companies seeking US market access in particular NHiS (the provider of business intelligence and data analysis to the pharmaceutical industry), which will benefit from FRA’s extensive database contact list of more than 300k healthcare contacts. FRA will also work with AMT (the provider of corporate finance and capital markets training to major international investment banks). FRA has 900k finance contacts in its database built up over 15 years. FRA’s established relationships will provide Wilmington’s international businesses with networking opportunities, enabling closer access to a wider pool of North American customers and markets. In turn, Wilmington sees opportunities to geo clone FRA events internationally and is already investigating opportunities in the UK and Europe. *1 unaudited before non-recurring costs which are not being acquired of $2.2m. No new financial information will be presented at the Capital Markets day event for shareholders and analysts being held this morning at 9.30 a.m.
Wilmington plc is the recognised knowledge leader and partner of choice for information, education and networking in Risk & Compliance, Finance and Legal as well as the Insight leader in a number of chosen industries. Capitalised at approximately £220 million, Wilmington floated on the London Stock Exchange in 1995.